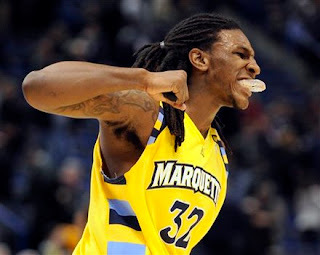 Marquette Keeps Tourney Hopes Alive ~ The Bucky Channel - The World of Sports from Wisconsin's Perspective. In their quest to at least make an appearance in this year's NCAA tournament, one thing that was lacking from Marquette's resume was a signature win. Well if the Golden Eagles were missing some big wins this season, they sure did get one Thursday night. Marquette went on the road to visit UConn, and fought back to get a huge win 74-67 in overtime. Marquette again held a nice lead at halftime with a score of 34-23. Holding the Huskies to 23 points in a half is pretty impressive, and that just shows how hard Marquette was working on the defensive end. But per usual, their defense fell apart after halftime. UConn started with a 26-7 run in the second half, and it looked like this might be another heartbreaking loss for the Golden Eagles. When this run was occurring, you had to have the feeling that Marquette's season was all but over. They couldn't afford another loss to a ranked team after leading at halftime. With 10:21 left to go UConn was up 49-41, but thankfully Marquette was able to hold UConn in check. Marquette would give up 10 points the rest of the game, and this time they made big shots when they needed them. The biggest shot of them all had to be Darius Johnson-Odom's lay up with 5 seconds to go which sent the game into overtime. If they can win out I'd assume that they'd no doubt be dancing come March. A few wins in the Big East tournament wouldn't hurt either. The game against Cincinnati is the big one, because the winner of that game might be the one that gets in. They are both above .500 in the Big East so you'd think both of them deserve a trip. But therein almost lies the problem, because how many teams from the Big East is the committee really going to take? All you can do is take it game by game, but winning at UConn was a great start for the Golden Eagles. Meanwhile, our friends at Anonymous Eagle have a great series going on their site following teams that are on Bubble Watch, make sure you check out their preview of this weekends' games.